Presented by the University of San Diego School of Law and Procopio, Cory, Hargreaves & Savitch LLP, the USD-PITI conference addresses international tax trending topics that affect cross-border business operations and tax and financial decisions. The premier educational and networking event for the latest developments in the international tax laws of the U.S., Mexico and Canada, this intensive educational and networking event at the University of San Diego attracts internationally recognized leaders and experts in government and private practice to present, explore, learn and discuss current developments in law and innovations affecting the field of international tax and related transactions. Visit the tenth annual conference website for conference topics, information and registration. USD School of Law is a State Bar of California-approved provider of MCLE and Legal Specialization in Taxation Law credits. Credit hours are currently being evaluated for this program. 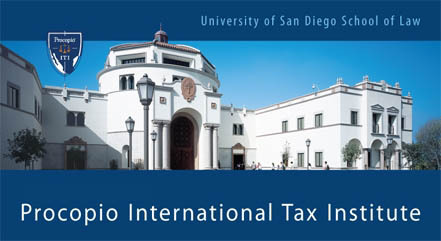 Founded in 2004, the Procopio International Tax Institute at the University of San Diego School of Law was developed to educate and inform foreign individuals and international companies seeking to do business in the United States. With the goal of increasing access to international tax knowledge and promoting cross-border education and cooperation between tax attorneys, accountants, financial experts and other interested business and tax groups, the institute presents an annual conference focusing on various tax related topics relevant to its international audience.